Every Tuesday evening this summer, the 2018 Classic Dinner Theatre and Michael’s Table present the hilarious G.B. Shaw comedy, Overruled – about two couples confronted by an unconventional challenge – along with a sumptuous three-course, home-cooked meal. Classic Dinner Theatre and Michael’s Table present the G.B. Shaw comedy, Overruled every Tuesday from June 5 to Aug. 28, 2018. Performed by some of Lanark and Renfrew Counties’ most talented up-and-coming performers – including Mallory Brumm, Katie Irvine, Connor Lyon, and Connor Williamson – the brand-new dinner theatre experience represents an extension of the annual summertime Classic Theatre Festival, which already features three mainstage professional productions, as well as a morning walking play and an evening ghost play. While dinner theatres sprung up across North America after World War II and reached their heyday in the 1960s and 70s, they have been enjoying a resurgence as companies like the Classic Theatre Festival and Michael’s Table come together around shared values of artistic and culinary excellence. “It’s a great opportunity to tickle your funny bone, please your palette, and create a memory you’ll enjoy long after the final curtain,” Smith says. 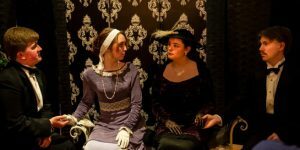 The Classic Theatre Festival decided to launch the new dinner theatre based on audience feedback about additional activities they would like to enjoy while attending a mainstage show. Given that 80% of audiences are tourists, a key request was getting home before sundown, and with a running time of 5 to 7 pm from June 5 to August 28, that should pose no problem for travellers coming from as far as two hours away.